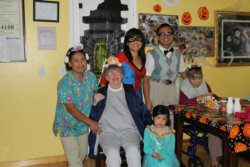 We care for the elderly and consider them our family. We hope you will move in with us at Rincon Valley Gardens LLC. See you soon! Run and operated by Sheila Sumabat, a Registered Nurse for 17 years in California. Her passion has always been caring for the elderly, thus most of her career has been in Geriatric Nursing. She believes that the elderly deserve the best quality of care and should be treated with compassion, respect, and dignity. She likes her residents’ families to feel secure and comfortable in the knowledge that their loved ones are well taken care of. Sheila works hard to train her competent caregivers to give only the best care possible as her clients’ age gracefully. Aside from her naturally loving and caring attitude, she is also experienced in managing 50 “skilled” beds. She was recently the Director of Nursing of a prestigious Life Care Community in Santa Rosa at which she had rendered her services for five years. Her mission is to expand her vision and offer better opportunities for frail elderly residents to live in a home-like setting with the best standard of care. If you want to find out more about us, please give us a call at 707-536-5738.